E.B. : First, how did you get into gun dealing, and second, what sparked your interest in the Remington 51? J.B.C. : Actually, the gun dealing came quite a bit later. The first 51 I'd seen was over at my Dad's house. He'd been gun collecting and buying and selling firearms for quite some. I had not ever been to a show, but I was over at his house visiting and he had a Remington 51 on the bar and I looked at it, and I said, "Man, this is nice. I'd like to buy it." And he said, "No, no, that's all right--I'll give it to you." I said, "Okay." That kind of sparked my interest. Then we started doing the gun shows, or I started going with him, and I started looking for 51s. I picked up a few of them, and eventually got into collecting things of value, interesting firearms, things like that. I started doing the shows on a more frequent basis, picking up more Remingtons, and we had opportunities to buy some long-term, well-established collections--the first of which was the Aberman collection. They were old money up in Pennsylvania. We went up there and got together with one of the collectors charged with liquidating the estate. My Dad bought several Colts and at the same time we were reviewing those we opened a drawer and saw some 51s. So we asked about them and eventually made a deal to buy them. E.B. : Do you know how your Dad came to know about the 51? He's been around for a long time, and he may have been around when they were still a lot more common. J.B.C. : Actually, I think it was just an interesting firearm that he picked up at the show. I don't know that he had any affiliation with it. 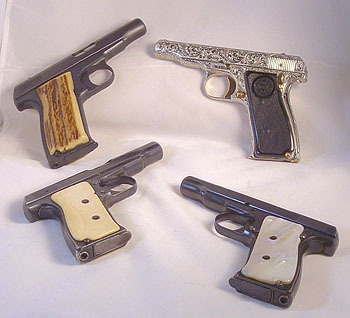 He collects Colts and .45 auto variants, and he understood that there was a model 53, which was a .45 military contract gun based upon the same design (just a blown up variation) and he knew it was a quality firearm. But as far as collecting the 51s, he had no interest. E.B. : Somehow, the 51 fascinated you, though. Was it because of the way it felt in your hand? J.B.C. : Yes. Absolutely. As soon as you pick one up the most pronounced impression you get is how well it feels in your hand. E.B. : That's what got me. 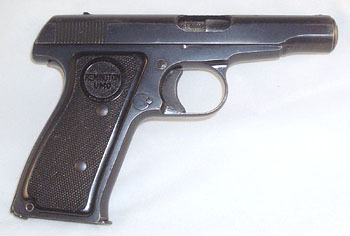 You showed me one at the gunshow, and I picked it up and said "Wow!" J.B.C. 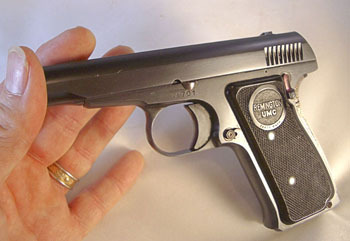 : As soon as it drops into your palm, you realize it's a well-fitted firearm, well designed. 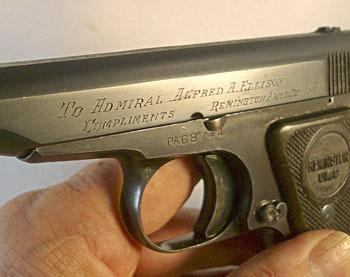 In fact, the sales slogan Remington had in 1921 was "Fits in the palm like the hand of a friend." That was the sales campaign that made all their salesmen blush... (laughs) I got that first one from my Dad--this was before the advent of computers--and I could find very little information on them. It was actually about two years before I ended up buying one in the box with paperwork and discovered how they come apart. The instinctual pointing... at first you pick it up and you feel that the mass distribution in your hand is really well done, and you go to point it and it's just right on and in fact, it doesn't matter who you hand it to, that's the overwhelming impression. Male or female, it seems to fit them real well. E.B. 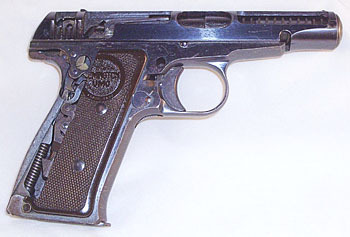 : The first 25 of the .380 models were produced in 1918. Does anybody know what happened to the other early serial numbers? J.B.C. : No, 23 is the lowest one known to exist, and I think they have a 3-digit serial number listed in that magazine article, number 281 or something like that, and that's the one that they like as being the earliest production model. J.B.C. : General production rules are that the first 50 or so guns are all going to go to the design network people, or financiers, or people whom they wish to do business with, so the strongarm guys get pretty well all those guns. E.B. : Do you think they might still be in private collections? J.B.C. : They may be in collections or in households up around the New York area. I imagine they're still just being passed around--Mom and Pop guns. 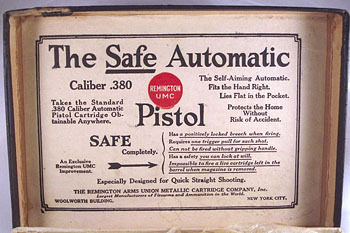 The guns in this article are from the J.B. Cargile Collection.